Commercial property developer Duignan & McCarthy is gearing up to sell its majority interest in Navan Town Centre at a guide price of €62m. The same vendor is also seeking a buyer for the equally buoyant Fairgreen retail complex in Mullingar which is expected to attract offers in the region of €11.5m. Joint selling agents Savills and Cushman & Wakefield are advising investment funds that if Navan is sold at the guide price, it will show a net yield of 7.31%, while Mullingar will produce a return of 8.47% on the net operating income. CarVal Investors bought the loans underpinning both shopping centres when the property market crashed. The two centres were developed by Duignan & McCarthy and continued to trade strongly right through the recession because of the strong line-up of tenants and their prime locations in Navan and Mullingar. In Navan, the vendor’s entire interests and the subject of the sale covers 66% of the centre which opened in 1980 and has been extended on at least six occasions since 1995, the last in 2009, to meet tenant demand. The balance of the shares are held by Irish Life. Duignan & McCarthy’s shareholding is generating a net operating income of €4.7m a year from the Navan centre which has an overall retail area of 23,225 sq.m (250,000 sq.ft) and a weighted average unexpired lease term of 7.9 years. The selling agents say the prospects for a purchaser to grow this income is “extremely positive” with both footfall and turnover improving over the past two years. The Navan centre attracts a weekly footfall of 115,000 and, because of its blend of convenience and comparison retailers, operates as a seven-day-a-week destination. One of the great strengths of the Navan centre is the 2,230 sq.m (24,000 sq.ft) food and fashion store operated by Marks & Spencer and owned entirely by Duignan & McCarthy. The rent is €478,000 a year. Other key shops owned jointly by Duignan & McCarthy and Irish Life are: New Look, which pays a rent of €451,000 a year; Heatons (€450,000); Boots (€400,000); Argos (€280,000); Easons (€250,000); River Island (€200,000); Dealz (€300,000); and Jack & Jones (€135,000). One of the few vacant shops in the Navan centre is shortly to be fitted out by Iceland after agreeing rental terms. The ongoing sale also includes 27 one- and two-bedroom apartments at the rear of the centre which are bringing in an annual income of about €180,000. The largest single rental contribution earned by Duignan & McCarthy is the €1.2m collected from two multi-storey car parks interlinked with the shopping centre and providing 1,500 spaces. Much of the underlying appeal of the Navan centre stems from the highly successful trading by Penneys, Tesco and two Dunnes Stores outlets – one a fashion shop and the other specialising in household goods – all with long leasehold interests. Fairgreen shopping centre dates from 2005 and is currently producing a net operating income of €920,000. This figure is due to rise shortly once agreement has been reached with a UK multiple which is about to rent the last remaining shop in the centre. The 9,754 sq.m (105,000 sq.ft) retail area with eight large stores has a particularly strong tenant line-up including New Look, which pays a rent of €230,000, and TK Maxx whose rent is based on the turnover. Also trading there is Dorothy Perkins which pays €180,000, Dealz (€140,000) and Elverys Sports (€120,000). Costa Coffee is currently fitting out a new store for which it will pay a rent of €55,000 a year. Dessie Kilkenny of Savills said both centres would attract investor interest for different reasons: Navan because of its high footfall in a large commuter town and Mullingar because of its strong tenant line-up and attractive yield profile. 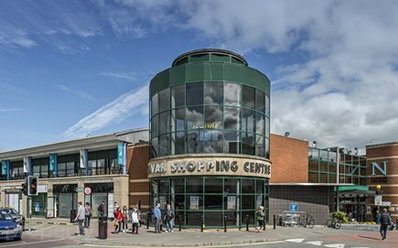 Karl Stewart of Cushman & Wakefield described the Navan centre as the northeast’s premier shopping centre and said Fairgreen would provide the next investor with a great line-up of household names and an opportunity to grow the income and take advantage of the current upswing in consumer sales.